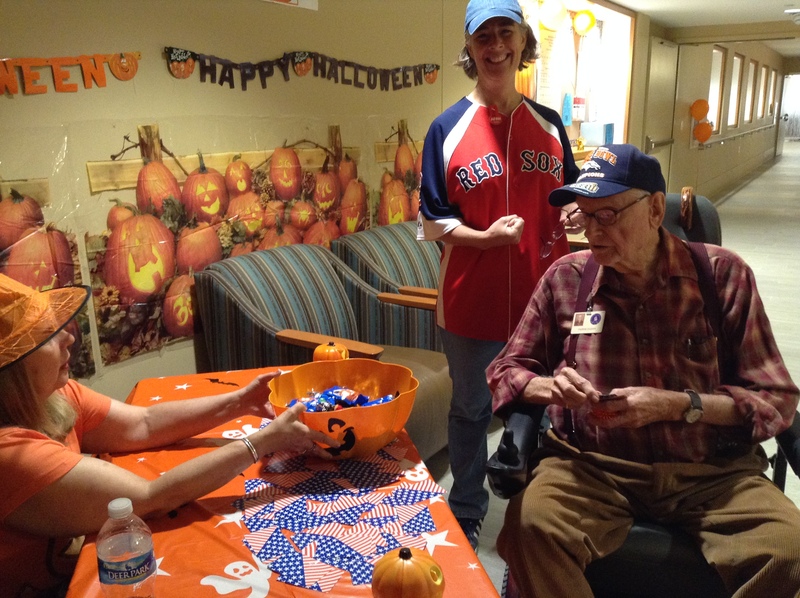 Friends of the Soldiers Home, in less than its second full year of existence, marked its 50th volunteer event at the Armed Forces Retirement Home in Washington with a gala Halloween Happy Hour on Oct. 29. 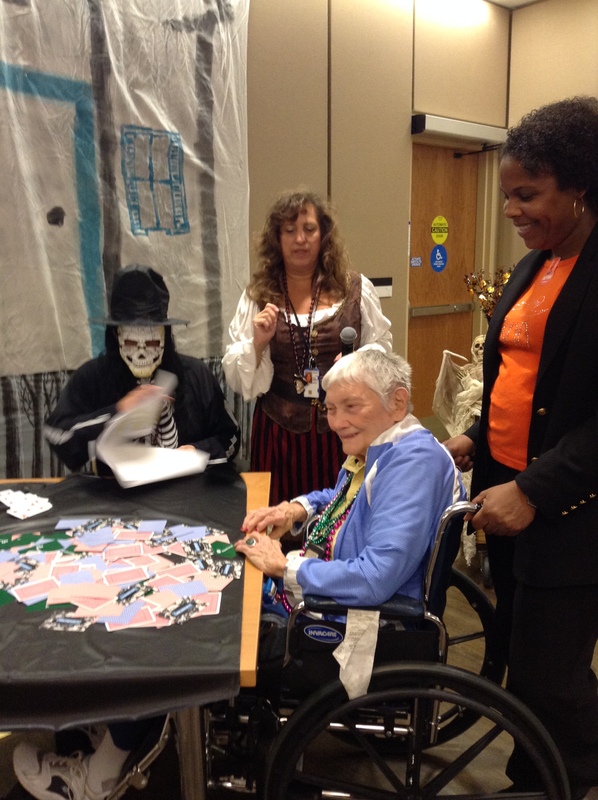 Each one of the 15 Friends volunteers who attended the event was in need, as they individually escorted numerous residents on an indoor Halloween “treasure hunt” through a cemetery, pumpkin patch and other locales in search of cards for the perfect poker hand. Friends, which formed to strengthen the bond between the 600-resident Home and the community, began volunteering with Jingo Night in December 2011, one month after the organization formed. Its efforts have grown to include three regular monthly events, Jingo Night, Happy Hour and Saloon Night With Friends, in addition to other volunteer activities such as the Spring Fling and July 4 festivals on campus. Friends is grateful to its wonderful volunteers that has made this all possible! We can always use more help. If you would like to be part of the action and are not on the e-mail list that gets regular alerts to volunteer activities, write Mary Bucci at volunteerfriendsofsoldiers (at) gmail.com. Our next 50 events get off to a great start this coming Tuesday, Nov. 5, at Saloon Night With Friends, when we bring in jazz singer Cecily Miles to entertain the veterans along with volunteers to serve drinks and snacks to keep them company! 2013 Cyclocross at the Soldiers’ Home is On! Two great events — the bike race at the Soldiers Home is ON this coming Sunday now that the government shutdown has ended. Follow that with our fundraiser next Wednesday evening at DC Reynolds! Full slate of bike races goes from 8:15 a.m. to 5:15 p.m. on the southwest corner of the Armed Forces Retirement Home campus. Enter through main gate at Upshur and Rock Creek Church Road. Free event, food and drink available. Friends of the Soldiers Home will honor some Home residents during the afternoon award ceremonies. DCMTB, which puts on the race, are major supporters of the Friends, so come on out! Then on Wednesday, Oct. 23, between 6-9pm go to DC Reynolds, 3628 Georgia Ave., D.C. for our Friends Fall Fundraiser, $10 per person suggested donation. I am sorry to report that we must cancel Sunday’s Oktoberfest because of the government shutdown. The Soldiers Home has had to suspend all activities except those related to life and safety. This situation is beyond the control of the Home and the Friends of the Soldiers Home. Our Friends board has spent an exhausting week trying to relocate the event or find some other way to go forward with it. (This is why we are informing you so late in the week.) In the end, nothing worked out. We are disappointed because we had such a wonderful event planned. However, we keep our disappointment in perspective. Our thoughts go out to Soldiers Home staff, and to friends and neighbors, who have been furloughed or otherwise negatively affected by this shutdown. We are also thinking of Soldiers Home residents, who have lost recreational services because of the shutdown. This time will pass. We plan many more opportunities to connect the community and the Home in celebration and volunteerism. The future looks bright for the Soldiers Home, the community, and the Friends of the Soldiers Home.